Navin R. CogDog: The new JIME’s here! The new JIME’s here! Harry Groom: Boy, I wish I could get that excited about nothing. Navin R. CogDog: Nothing? Are you kidding? Page 106 – Levine, Alan H.! I’m somebody now! Millions of people look at this paper everyday! This is the kind of education publicity – your name in a refereed journal – that makes people. I’m in print! Things are going to start happening to me now. This is the joy of being published, right? 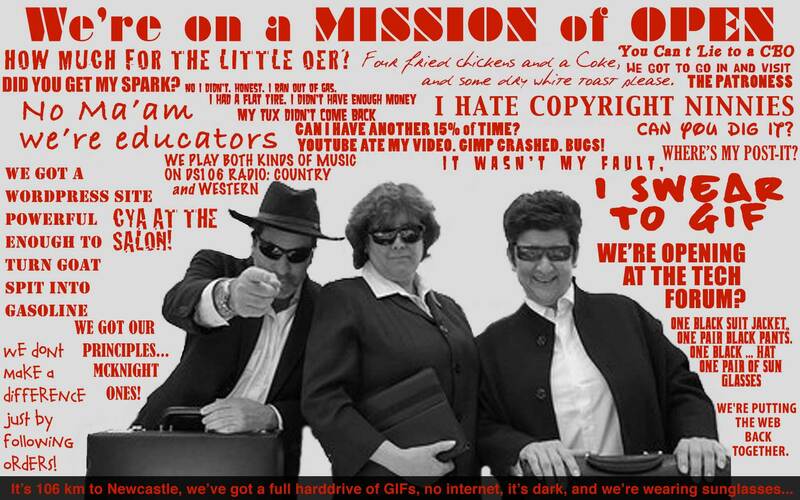 Just in time for putting PDFs in your friend’s stockings… A DS106 Thing Happened on the Way to the 3M Tech Forum< This is the published version of the paper I co-authored with Rochelle Lockridge and Mariana Funes based on our presentation at OER14. After months of edits, rewrites, numerous Google Doc versions, incorporating reviews, finalizing all of the references and commas and stuff– it’s done! This case study illustrates how DS106, a computer science course in Digital Storytelling from the University of Mary Washington (UMW) and accessible as an open course on the web, is being explored in a corporate environment at 3M, an American multinational corporation based in St. Paul, Minnesota, to build community, collaboration, and more effective global communication skills. Our assertion is that the pedagogy and assignments of DS106 can be adapted for use within a corporate intranet, using creation and communication tools available internally to all employees. Our approach is to work in a layered ‘open organisational web’ guided by a specialist facilitation role: that of the ‘Salon Patroness’ or network connector. This 3M-DS106 Salon model may help address challenges faced in a ‘default closed’ corporate environment, providing a zone of safety to encourage the evolution of a more open mind-set necessary for increased creativity and innovation. In its first iteration in Fall 2013 the 3M-DS106 Salon participants were interviewed at the end of the course. They identified learning, challenges, and a desire for integrating the course material into their professional work. 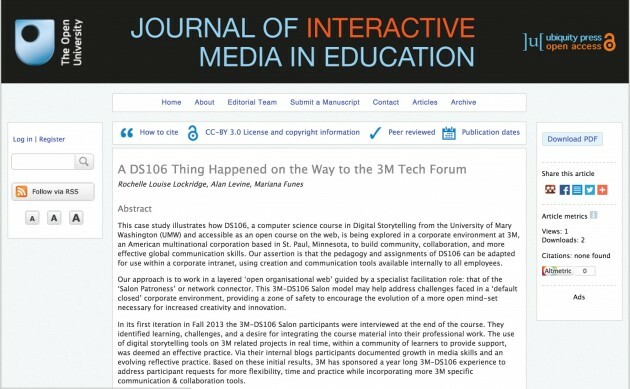 The use of digital storytelling tools on 3M related projects in real time, within a community of learners to provide support, was deemed an effective practice. Via their internal blogs participants documented growth in media skills and an evolving reflective practice. Based on these initial results, 3M has sponsored a year long 3M-DS106 experience to address participant requests for more flexibility, time and practice while incorporating more 3M specific communication & collaboration tools. I have to admit, it’s pretty nice to have this done. but don’t be thinking Navin has any books in mind. A paper was way more work then… well it’s done. Thanks so much to Rochelle and Mariana who carried the last edit load when I was off in another country. Pingback: Things are going to start happening to me now. The Blogger. Actually some of both serious and sarcastic. It seemed pretty ridiculous for long it took to represent what i thought we expressed well, but the reviewers did help us honecthe message. And it is rather rewarding to see in digital print. Not the first time by far, mine was in 1991 though it was about the fluid mechanics of pyroclastic flows http://cogdogblog.com/2004/12/22/i-google/ cheers to you! Tap. Tap. Is this Thing On? 2014?